Hello, Ribbon Lovers! 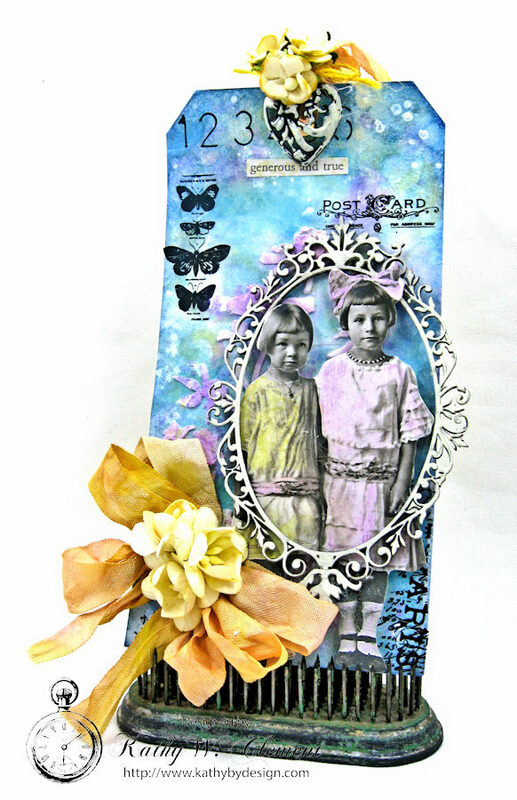 You all know how much I love to use Distress Inks to create custom seam binding ribbon on my cards and projects. Well, I caved in and bought the new Distress Oxide Inks recently, and I was curious to see if they would do a good job of creating custom ribbon. After an afternoon of inky goodness, I'm happy to report that I love the results! 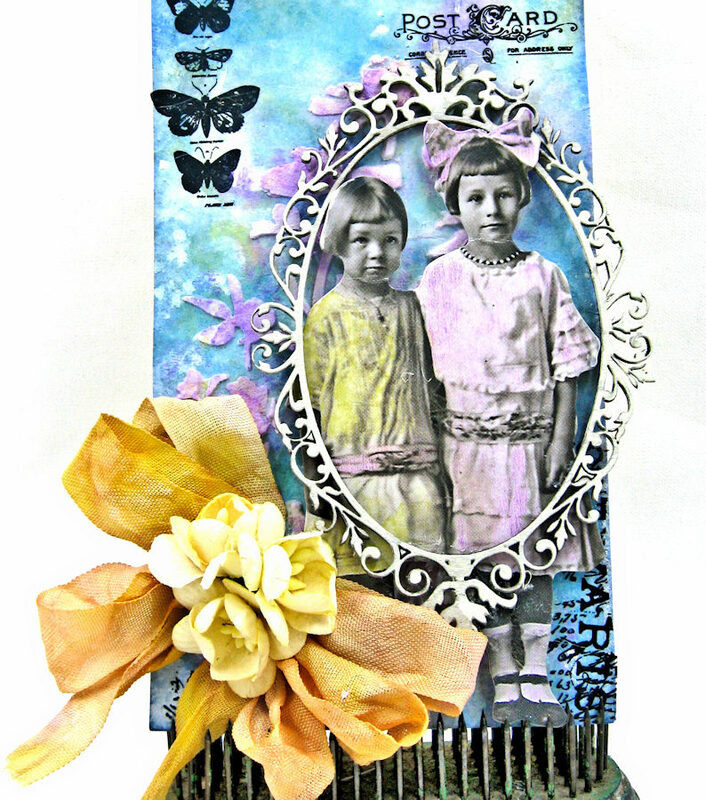 I started with a standard sized manila tag, then added Distress Oxide Ink in Broken China, Faded Jeans, Fossilized Amber and Wilted Violet to build my base layer. One thing I've learned about working with Distress Oxides is that the more water you spritz onto the ink, the better it seems to look. For this background, I used the standard "smoosh onto your craft sheet, spritz with water, swipe and tap" method, but I only worked with one color at a time. I also heat dried each layer before proceeding to the next. After dressing the tag up with some rub ons and texture paste, I spritzed it with Dylusions White Linen Spray. 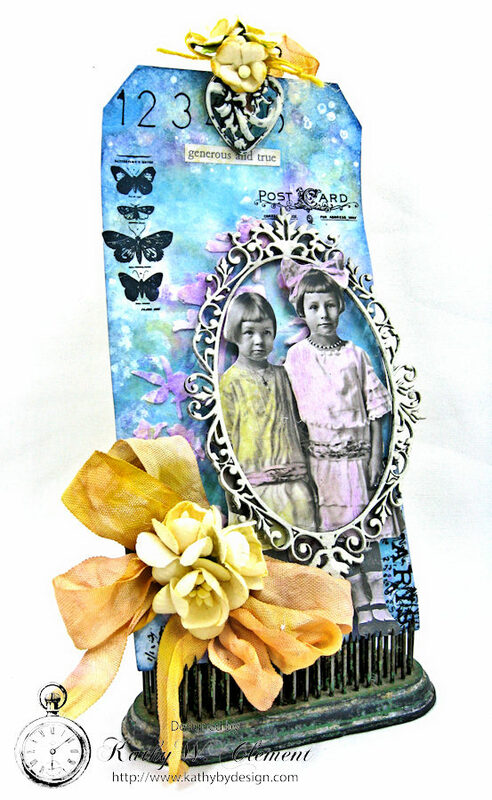 These cute paper dolls from Tim Holtz are colored with the DO Inks and added to the party along with a chipboard frame that I painted with Picket Fence Distress Paint. To alter my seam binding ribbon, I smooshed Fossilized Amber DO Ink onto my craft sheet. Then I spritzed it with water until little beadlets formed. Next, I tapped about a yard of white seam binding into that inky puddle. The DO Ink gives the ribbon a heavier body than standard Distress Ink, and it holds the lovely crinkles even better. After drying the Fossilized Amber, I created a smaller puddle of Wilted Violet Ink and just tapped the ribbon in here and there to add some purple highlights. Then I dried the ribbon with my heat tool again. Next, a visit to the Zutter-Bow-it-All Tool where I tied a shabbylicious bow. WOC Cream Cherry Blossoms and Sweetheart Blossoms were the perfect finishing touch. So, if you were curious, now you know: Distress Oxide Inks are great for altering seam binding ribbon! 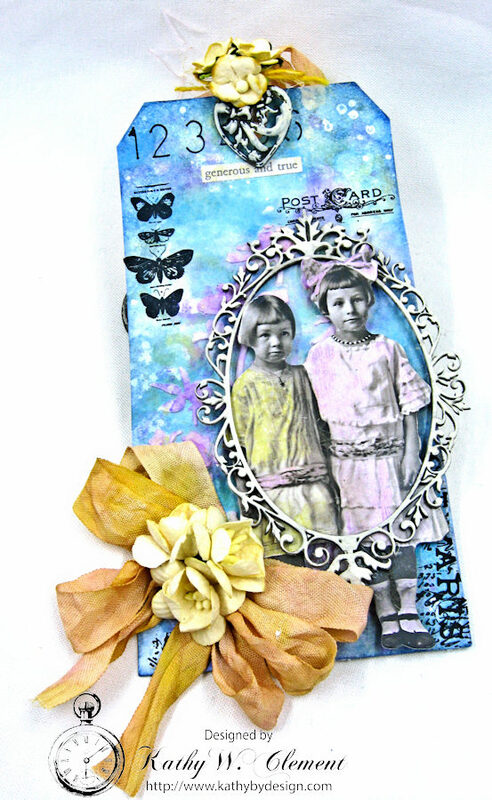 What a fabulous result you got with the DOX, Kathy, both on your background and the crinkle ribbon! I've got to give these color combinations a whirl! Your tag is amazing in color, design and details! Thank you for a fabulous step by step! Hugs! Thanks so much, Sara Emily! I was pleased with how well the seam binding "took" the DOX.